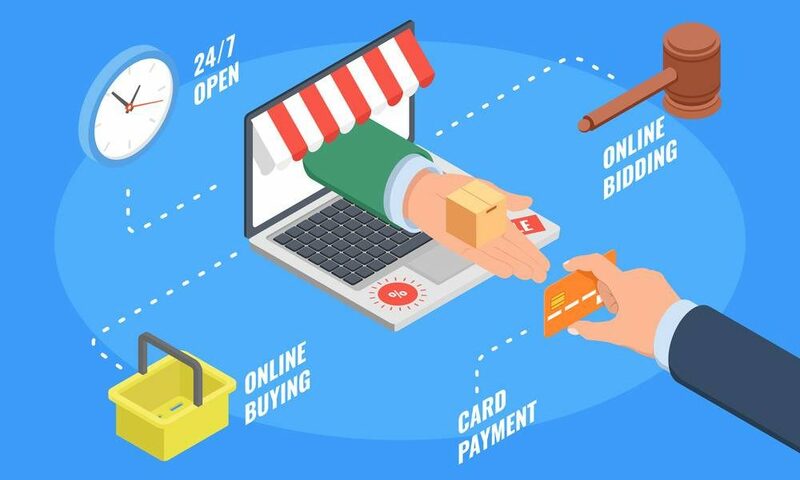 What is e-commerce, how does e-commerce work? E-commerce is not something outside of this world, It’s not magic or a kind of abracadabra. It is the act of selling a product or service online. The Internet is a busy marketplace that never sleeps, just at the point when you logged out from your device, thousands of other internet users are coming online. E-commerce is a smart way to target online users. Won’t you rather get a share of the multi-trillion dollars e-commerce marketplace? No matter your product or service, your audience are online waiting for you. If Buka hut can sell cooked food using e-commerce, why can’t you? Buka Hut is a food vendor with an outlet in the major business hub in Lagos. I am a customer at the Admiralty way outlet because it’s close to my Lekki office. When I first discovered the restaurant, I occasionally stop to buy food on my way to the office or alternatively send my office cleaner to help me out. One day, I was at the restaurant for lunch when their staff told me that I can order through their website. The following day I visited their website, ordered for amala, gbegiri, and ewedu with goat meat. I got the order about 15min later. It was just the way I wanted it. If Buka hut can sell amala and gbegiri using e-commerce, you can do better. Ecommerce simply means ELECTRONIC COMMERCE. It is the sales and purchases of goods and services through the internet, if you have ever bought an item or service online, you’ve engaged in e-commerce, this could be paying for a subscription through quickteller. If you have ever sold anything online (like selling your car on Jiji or Olx), you have also engaged in e-commerce. 1) You can start big with little capital, all you need is a professionally designed e-commerce website. 2) You don’t need a store or office, your website is your store. 3) No geographical limitation, sell to people who are close or far and be able to deliver to them wherever they are. 4) Reduce resource hiring and training cost, you can start with little or no staff. Just you and a delivery agent. 8) Personalize your e-commerce store as per the customer expectation. I have always practiced e-commerce by selling my web development services and training online but In 2015 I participated in full time buying and selling online, I was selling a physical product. It all started when I went for an 18 months course in Accra Ghana. Arriving Accra, I was accommodated by a friend who was living in Nungua area and we later relocated to Lapaz while my school was adjacent Busy Internet in Circle. I lived with him for some months and I felt he has tried. I needed a place of my own, I wasn’t making much money except occasionally when I get web development project through recommendation. I don’t have the fund to rent an apartment but luckily for me, I got a web development contract. The project was huge so as the money involved, after delivering the project I had money to rent a room and parlor self contain in Lapaz area, Fish Pond bus stop precisely. The apartment wasn’t too perfect but it’s cool. Jackie Appiah was my neighbor, we lived on the same street and her house was just 4 building away from mine. I have visited some area in East Legon and I would love to live within the area but the rent is high and I don’t get web development project that often. So I decided to support myself by selling a product. I wanted a product that is in high demand. And most importantly a product I can use myself, in case there are left over. My experience as my mom’s no 1 sales rep made me understand that a trader hardly sells all his product. Some item might get spoilt and for some items, people won’t just find them appealing, not because they are bad but because that is how business is. A Yoruba adage says “funra oloja lo ma fi owo e ra oja ti ko ni ta” meaning “a trader will surely buy some items he will never sell”. I knew all of this so I have to play safe with my little capital so I don’t stock items I won’t sell. I finally concluded on selling wears, with the intention of starting with men wears. My next assignment was to research the market. Identify my target audience and where to find them. My research made me understand that the sales of a quality shirt are not in circulation and when you get some, It’s very expensive. I was able to identify that market and I’m ready to fill in the gap. I went to Accra’s biggest market (Makola Market) just like the Lagos Idumota market. It took me almost a day to walk around the market and I manage to find 4 different stores that sell the kind of shirts I wanted for my clients. I ordered some of the shirts but I played safe. I ordered for only my sizes. I did that because if no one buys, I can use them. I was just starting so I don’t know what the sales will be like. All I had was just an idea which was, if I have quality wears at a competitive price, people will buy. The following day, I bought a domain and hosting, set up an e-commerce website where people can order online. I also set up a facebook page for my business. Being e-commerce (online store), I worked closely with a photo studio along Kings B area. I will take the clothes to the studio and be the model, wear them and take pictures since they are all my size. With that, I had lots of good pictures that were displayed on my website and facebook page. Now, my e-commerce business is ready to kick start. But my website and Facebook page were new and nobody knows about my e-commerce store. Before this time, I have been using the Facebook ad to promote my web development business and It has really helped. After a deep analysis of the available adverting platforms with low cost and high ROI, I finally settled for facebook ad for paid advertising and I was using OLX GH and Jumia GH for free publicity. At this stage, I already gained confidence because there was no online store that focuses on men clothing in Accra. One synonymous fact to most of my businesses is that I usually start when no one or very few people are business. And I understand that a lot of people in Accra will want an online store they can browse from the comfort of their office, make an order and get it delivered to them since we all want comfort and good value for our hard earn money. When it comes to choosing a payment platform for my e-commerce business, I went for pay on delivery because a lot of people won’t want to pay upfront since they don’t know me or my brand. But providing a pay on delivery option, they have nothing to lose so they won’t be scared to place an order. They only pay when they like the wears and feel comfortable with it. One of my major selling technique was that I always go to my client with different sizes and extra wears. What I mean is that, if you order for 5 medium size shirt. I will come with 8 medium shirts, 5 immediate small and 5 immediate large. Upon my arrival, if the medium fits you, then I have 3 more shirts to market to you. If you like them, you are more likely to buy because you are in your spending mood. In case the medium does not look nice on you, its either you go for the immediate large or the immediate small. No matter what the situation might be, your size is in my bag. I can’t remember visiting a client without making a sale except for a client who invited me to Spintex area but on getting there he didn’t pick my call, I waited for roughly 2 hours hoping he will call but he didn’t so I left. The same client placed another order some days later and apologize for the other day but I didn’t go for the delivery because I wouldn’t want to be a victim of no sales twice. Aside from that, I can’t remember visiting a client without making a sale. Most of my clients are foreign investors, I guess that’s because they are the ones who search for items online. My biggest sales came in on this faithful day, I was at home surfing the internet for tips to grow my business and this call came. It was a Lebanon foreign investor Mr. Haasim, whose company was located around Kaneshi Industrial Area. The man ordered for 10 medium shirts. That was the highest order I ever got, I was so excited not knowing that the big sales are few hours ahead. I quickly arrange my bag, took 12 medium shirts, 10 small and 10 large shirts (as usual). My bag was heavy so I had to order for a taxi. I was not aware that my client also ordered for polo shirts from another seller who is a Ghanian. As a sharp Naija hustler, I got to his office first. Upon my arrival, he asked, “are you the person I ordered polo from?” I quickly replied, “No sir” you ordered corporate shirts, sir. That was when I realized he ordered for polo shirts from another seller. The next question he asked was if I am a Nigerian and I replied yes. He said I ordered polo from someone some hours before I ordered your shirts and here you are. I like your approach to business, I like doing business with Nigerians. That was the first time I had someone praise Nigeria, a foreigner for that matter. I brought out the shirts and help him test it one after the order. The medium size was perfect for him so he bought the entire 12 shirts at 120 cedis each that makes a total of 1440 Cedis an equivalent of N144,000. Just as I was putting the remaining clothes in my bag, his friend Mr. Aatazaz walked in, he is also a Lebanon. He saw the shirts and asked if they were for sale? Yes, yes sir they are for sale, that was my response. He tested it and the medium size was perfect for him but his friend bought them all. So I told him to give me some few mins to go bring more wears. Leaving their office, I went straight to Makola market which is about 15min drive from Kaneshin Industrial area, I bought some medium shirt and return to their office. I was able to sell an additional 12 medium shirts which make a total of 24 shirts sold in just one day, at a total cost of N288,000 (naira equivalent) That was my biggest sales. Now, I have more money to spend on facebook ad, which I did. Intense Clothing starts gaining popularity in Accra and I was making more money. After making the sales, I got another breakthrough that same say. That was the moment my client asked if I sell shoes. I was mute for some few seconds and it was so obvious because I don’t sell shoes. Finally, I gained confidence and said yes sir, I sell shoes. They both asked me to bring some shoes, Mr. Haasim’s size is 45, while Mr. Aatazaz uses size 44. At that point, I was uncomfortable because I just made a promise I’m not sure I can fulfill but I manage to tell them that they should be expecting me the next day. I did that because as a young entrepreneur you must be able to say yes to every offer that comes your way, then find a way to make it work. Its hard, but that’s what makes you an entrepreneur, you must learn how to make things work. I was scared because, during my survey at Makola market, I didn’t notice any store that sells the kind of quality shoes my client wants, I have walked the entire Makola market and I knew there was none, so where do I get shoes for my client? Guess what, I finally supplied the shoes. I got the shoe from a boutique it was expensive and I needed to go with varieties I couldn’t have used all my capital to buy shoes. I got the shoes within the range of 350-500 cedis and I am expected to go with 5 each so they can choose from. What I did was dropshipping, I didn’t know the name then. I only used my initiative and it worked. Drop shipping is another huge industry that I will like to talk about. Hopefully soon, I will share my experience with drop shipping and provide tips on how anyone can start a drop shipping business. Dropshipping in most cases does not require capital only on few occasions you might need little capital. My name is Ajibola Rilwan, I am an IT Consultant and a web developer with over 10years of working experience and I can help you develop a sales-oriented website that will present your company as an industry leader to the online users. Call us at 07062996486 as we look forward to delivering a sales-oriented website to your company.